(Above) Homepage to Appetite Engineers. 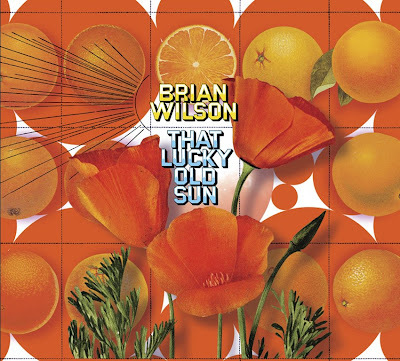 (Above) Cover art to Brian Wilson’s That Lucky Old Sun, produced by Capitol Records. Click for larger view. 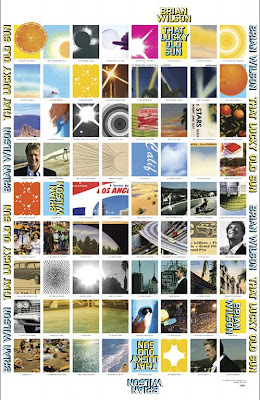 (Above) Front and back panels to Brian Wilson’s That Lucky Old Sun. Click for larger view. 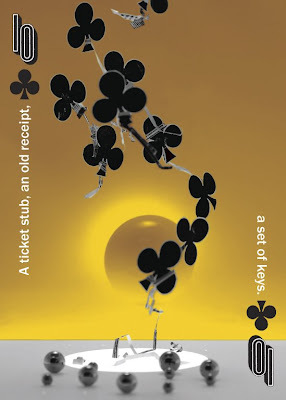 (Above) Page of stamps, inside piece to Brian Wilson’s That Lucky Old Sun. Click for larger view. (Above) Page of stamps (detail). Click for larger view. 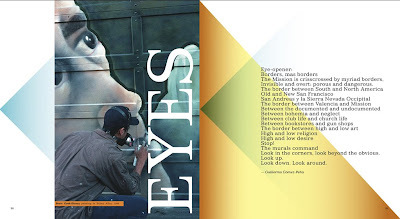 (Above) Cover to the book, Street Art San Francisco: Mission Muralismo, published by Abrams. Click for larger view. (Above) Inside spread to Street Art San Francisco: Mission Muralismo. Click for larger view. 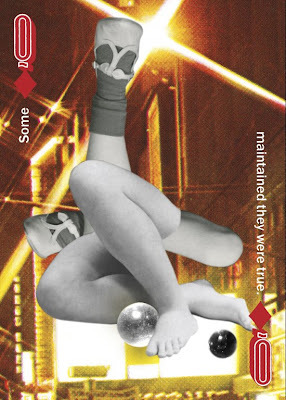 (Above and all images below) Playing cards from the “Double Down” playing card project, by the San Francisco Museum of Modern Art. Click for larger view. I FIRST MET MARTIN VENEZKY TWO YEARS AGO when he and I were paired together to give a talk to the Boston chapter of AIGA. At the time, I was showing my collection of found photographs at the Peabody Essex Museum in Salem. Since Martin uses found photographs and other ephmera in his design, the museum and Boston AIGA thought that we would make for a good talk to their membership and others who attended. We became friends and hence, this interview for you today. John] Hi Martin... thanks for doing this interview. I’d like to take you for a ride in the “way-back machine” to when you were a kid. We’ve talked about this in the past and I think your childhood is worth sharing, if you do not mind. What were the precursors to your life now, as a world renowned designer. Were you a collector, did you draw, paint, listen to music, read comic books—what kind of things made you who you are today? Martin] I was a painfully introverted kid. I spent most of my time inside the house, even during the summers. Yes, I collected lots of stuff...the usual things like Life magazine, postage stamps, Hardy Boys books. But I also created some unusual archives. Because I lived in the Maryland suburbs of Washington DC, I discovered that if you called a congressional office and asked for information on their home state, you get big packages filled with brochures, magazines, and maps delivered to your mailbox. (Postage is free for Congressional offices). I amassed boxes of these, and tried different methods of filing them...by state, by type, by size. My uncle was an expert calligrapher and cartographer and he bought me a basic Speedball pen and ink set which I treasured and practiced with. I started drawing my own maps of imaginary countries, and collaged pictures from the travel brochures to indicate the geography. It was an elaborate project, but one that helped distract and calm me down. Through all of this I became deeply drawn to the radio. I listened all the time to top 40 stations, but also came across the radio work of Jean Shepherd, whose New York shows were rebroadcast in Washington at night on the FM dial. I’ve recently listened to a number of them for the first time since I was young, and they are still mesmerizing. Wow! They bring back a flood of memories. Sadly, my parents divorced in 1973, when I was in high school. My dad decided to sell our family house (my mom had already moved out and I was living with her), and gave us just a few days to clear out all of our stuff from the basement. That was where all of my collections, my drawings, my inked maps were stashed. I couldn’t recover all of my stuff by my dad’s deadline, so he threw it all out just as he threatened. I didn’t think he would really do it...and I couldn’t believe it was all gone, just like that. That really hurt a lot, not just that I lost it all, but that he cared so little about it as an archive of his children’s lives. John] You told me once that you spent some time as a DJ. That’s kind of fun. Tell me about that. Martin] The radio was my first love. Since I was very young I had always wanted to be a radio DJ, but felt I would never be able to that. (Why, you ask? Well, at the time, all radio stations performed charity work by fielding basketball teams to play against school faculties for fund raising. I knew I couldn’t do that. I sucked at sports and I was so terrified of being in public. It’s an odd kind of reasoning, but that’s what being a kid is all about, huh?) When I was older I started collecting records and really liked the way that people responded to music. I also liked the idea of being behind the scenes manufacturing the entertainment rather than being a guest at the party itself. It was a more comfortable place to be (...and not unlike being a designer...) Because I had a really good record collection and was knowledgeable about music, I decided to try out for a part time night gig as a club DJ while I was working as a graphic designer during the day. The clubs were really bars that had small dance floors, and the kind of music I played at first was mostly Motown, pop, college-frat type stuff. Pretty easy and forgiving. But I became more and more intrigued with dance music so I shifted over to venues where the focus was more on the club and dance floor. My mixing skills were primitive, but my enthusiasm made up for it. Most of the audience was relatively uninformed at the time (this was the early 80s), and “Thriller” was still the penultimate dance record for these folks. But I was able to weave in odd selections that the crowd came to enjoy. Early Madonna, some simple rap tunes as the evening progressed, unusual European mixes of things they already knew. It was really great fun, and was the main component of my social life at the time. When I moved to San Francisco in 1985, I knew that my skills were nowhere good enough for the clubs, so I just stopped. I continued to buy the records for several years, and still have a huge stash of vintage dance 12” vinyl, some barely ever played. John] I can totally see how the process of being a DJ could influence a budding designer. By selecting music, you were in control of a crowd’s entire actions. Put on “Thriller”— the crowd goes crazy… and you made that happen. DJ’s are puppet masters (like designers! Ha!). And, it’s a completely creative, interactive act. Let’s go forward a bit later, when you were at Cranbrook. You were older than most of the students. You mentioned to me that your pre-Cranbrook work was rather conventional. Did your current style emerge and begin to take shape there in some way? Martin] Yes, although the hand skills that I had learned on the job, and as a kid all came in handy and still do to this day. I graduated from Cranbrook in 1993, and at the time, the desktop culture was still being formed. Computers were still clumsy, slow, and aggravatingly crashable. Almost no one owned their own...there were no laptops, so we had to share. 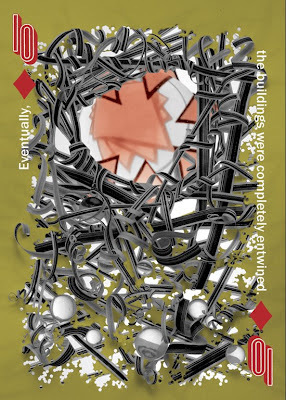 I was able to shift back and forth between hand work and digital work...more out of necessity as aesthetic preference. But those skills have helped me today. 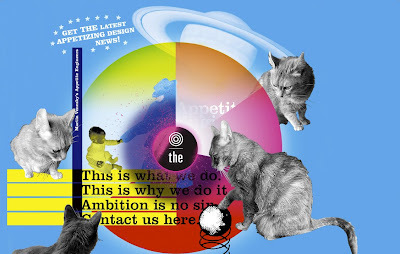 I also really began collecting ephemera and incorporating my own interests—both visual and content—into my work. There was a darkroom that was part of the Cranbrook design department. But no one had used it for years. I was able to get it up and running, along with a fantastic state-of-the-art photostat camera that was installed just as the demand for photostats withered. So after scraping away the dried chemicals, finding an old manual and a source for supplies, that, too, became a favorite tool. John] You had one of the coolest jobs ever, being the Art Director of Speak Magazine. What was that like? Martin] You can find a terrific history of the magazine on the Speak website (www.speakmag.com), written by the publisher and editor, Dan Rolleri. I think he captures the time very well. For most of the 21 issues, it was just myself and Dan sitting across from each other in a very large warehouse space. There was no money in it, and lots of pressure. Lots of insecurity, too, since neither of us had worked on anything like this before we were never sure how we were doing. 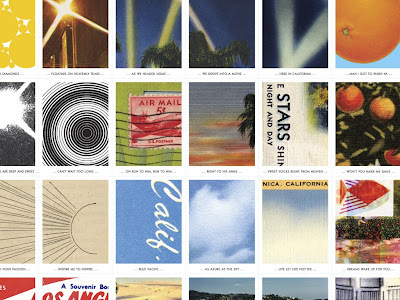 John] I loved your recent work with Capitol records, the Brian Wilson “That Lucky Old Sun” CD. Did they give you any direction or restrictions on that? Martin] I worked very closely with Tom Reccione, the Creative Director at EMI/Capitol. We developed a terrific working relationship and could bounce ideas back and forth. Tom was able to pull together a ton of great material from which I could choose for the package. 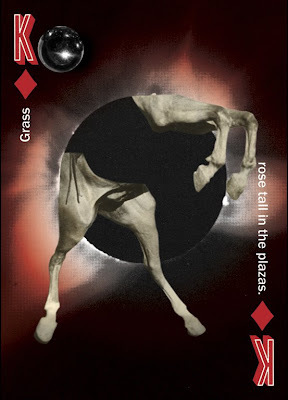 I also contributed a bunch of things from my own collection of ephemera. Throughout the whole project we seemed to be on the same page. His suggestions and critiques were always on-the-money, and I was able to surprise him with my own twists on the project as it developed. John] So, what’s new, Martin, what’s coming from Appetite Engineer’s next? Martin] Right now I’m working on a line of products for the San Francisco Museum of Modern Art... t-shirts, bags, mugs, all using the typographic collage method that I love doing. 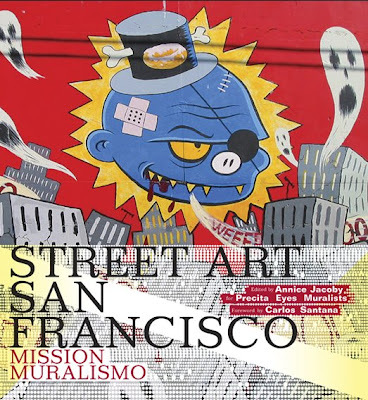 Two books that I had a strong design hand are set to be released in the coming months: Street Art San Francisco: Mission Muralismo from Abrams and Finding Frida Kahlo from Princeton Architectural Press. I’m also about to leave for New Orleans to lecture at Loyola and meet with the graduating design students. Teaching is a big part of my life (I teach full-time at California College of the Arts in San Francisco in the graduate design program), and most of my traveling centers around lectures and workshops I give for students and designers. John] Martin, I just want to say thanks so very much for this insightful interview about your life and your work. It was great! Ahhh-h Gary, you are too kind. I try. I have stumble on your blog via one of my followers. Found it quite appealing. Will visit you again...and often I may add. 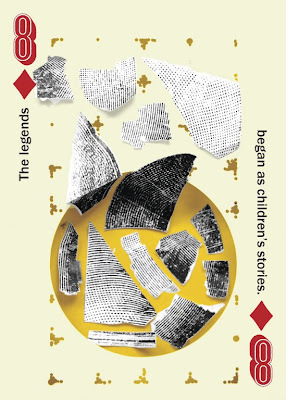 I loved this conversation with Martin.I worked with him on the Mission Muralismo book, and marveled at the relationship between these stories and his quiet authority,whimsey, depth, sensitivity and inventiveness. Thanks for letting me discover more about someone I already admire.